There is a broad spectrum of cardiac and paracardiac masses, which includes nonneoplastic as well as neoplastic lesions, both benign and malignant lesions. In addition, there are several normal variants that may mimic masses. CT scan has become an important imaging modality in the evaluation of these cardiac and paracardiac masses due to several advantages such as high spatial resolution, good temporal resolution, wide field of view, and multiplanar reconstruction capabilities. It is particularly valuable in patients who have contraindications for undergoing MRI. 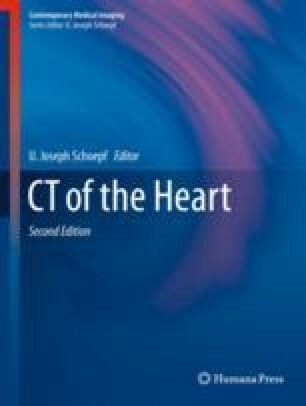 CT is ideal for detection of calcifications and evaluation of vascular supply in cardiac masses. In this article, we review the role of CT in the evaluation of cardiac and paracardiac masses. Kassop D, Donovan MS, Cheezum MK, et al. Cardiac masses on cardiac CT: a review. Curr Cardiovasc Imaging Rep [Internet]. 2014;7(8):9281. Available from: http://www.ncbi.nlm.nih.gov/pmc/articles/PMC4090749/pdf/12410_2014_Article_9281.pdf. Fan C-M, Fischman AJ, Kwek BH, Abbara S, Aquino SL. Lipomatous hypertrophy of the interatrial septum: increased uptake on FDG PET. AJR Am J Roentgenol [Internet]. 2005;184(1):339–342. Available from: http://www.ajronline.org/doi/pdfplus/10.2214/ajr.184.1.01840339. Murillo H, Restrepo CS, Marmol-Velez JA, et al. Infectious diseases of the heart: pathophysiology, clinical and imaging overview. Radiographics [Internet]. 2016;36(4):963–983. Available from: http://pubs.rsna.org/doi/pdf/10.1148/rg.2016150225.